© Paris Tourist Office - Photographer: Marc Bertrand. Valentine's Day is coming up, and what better city to celebrate in than Paris, the city of love? Whether you're celebrating with a loved one, a friend, or on your own, there is a perfect Parisian hotel for the occasion. Beautiful atmosphere, close proximity to all of Paris's most famous sights, and a certain je ne sais quoi... what more could you ask for in a Valentine's Day hotel? Here are some hotels to book for your perfect Valentine's Day in Paris. This grand hotel in the Marais district faces Place des Vosges, Paris's oldest square, and is a 2-minute walk to Victor Hugo's house. The Chemin Vert Metro station is 4 minutes away on foot. Not only that, the hotel offers 54 uniquely decorated rooms ranging from classic to contemporary. Located in 1st Arrondissement, this luxury hotel with a full-service spa is within a 10-minute walk of Comedie-Francaise, Palais Royal, and Louvre Museum. 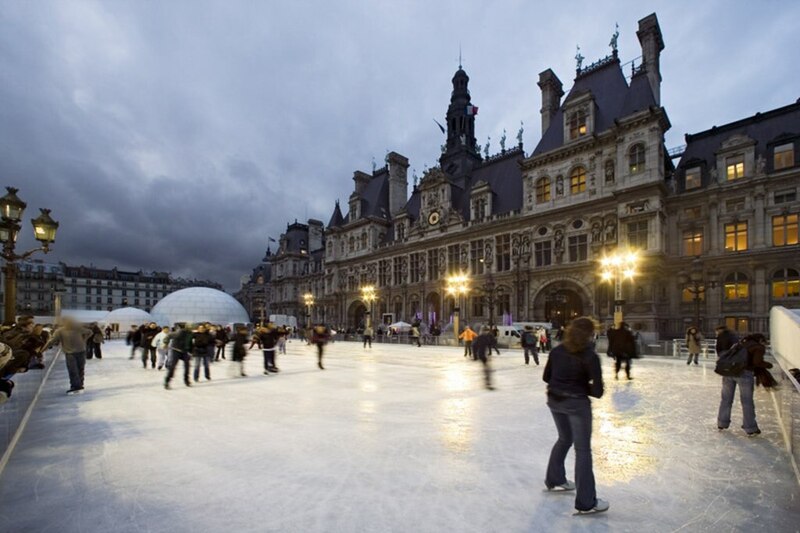 Paris Opera and Galeries Lafayette are also within 15 minutes. This family-friendly Ville-d'Avray hotel is located on a lake, 3.1 miles from Palace of Versailles, and within 6 miles of Theatre Andre Malraux and Malmaison. Statue of Liberty - Paris and Roland Garros are also within 6 miles. The hotel features three restaurants, a full-service spa, and a health club, and a bar/lounge, a coffee shop/café, and a spa tub are onsite, too. This Hausmmannian-style hotel is located in Serris, opposite Val d'Europe Shopping Center and a designer outlet village. It is five minutes from Disneyland® Paris via complimentary shuttle. A modern seven-storey Paris hotel inspired by the Art Deco style, overlooking Parc de Monceau, half a mile from the Champs-Élysées. Hotel guests can also work out with personal trainers and unwind with a hydrotonic bath, a massage and a range of beauty treatments. Located in 16th Arrondissement, this hotel is within a 10-minute walk of Lido and Arc de Triomphe. Eiffel Tower and Palais de Chaillot are also within 1 mile. Located in 7th Arrondissement, this luxury hotel is within a 15-minute walk of American University of Paris, Grand Palais, and Rodin Museum. Eiffel Tower and Les Invalides are also within 1 mile. Located in 17th Arrondissement, this hotel is within a 15-minute walk of Palais des Congres de Paris and Arc de Triomphe. Parc Monceau and Palais de Chaillot are also within 1 mile. Located in 2nd Arrondissement, this hotel is within a 10-minute walk of Opera Comique, Galeries Lafayette, and Paris Opera. Palais Royal and Louvre Museum are also within 1 mile. It also has an indoor pool for guests. Located in 5th Arrondissement, this romantic hotel is within a 15-minute walk of Jardin des Plantes and Grande Galerie de l'Evolution. Notre Dame Cathedral and Pantheon are also within 1 mile. Looking for more inspiration for the French capital? Check out the Expedia blog for a lot more articles about Paris, or head over to our Paris guide for things to do in the city. Where are you spending Valentine's Day this year? Mercure Paris Centre Tour Eiffel is less than a 5-minute walk from the Eiffel Tower and the Seine. The Louvre and Jardin du Luxembourg are both about 15 minutes by subway. Located in the heart of Paris on the Left Bank, across from the Montparnasse train station, this hotel is only a few metro stops away from Saint Germain des Près and the Eiffel Tower. Privileged access to tourist attractions, just minutes walk from the Opera Garnier, department stores and the Champs-Elysées. Please note: The cost of an extra bed does not include breakfast. For more details, please contact the office using the information on the reservation confirmation received after booking. Design hotel located close to Montparnasse Train Station, and only a 10-minute walk from major tourist sites: Tour Montparnasse, Saint-Germain-des-Prés, Eiffel Tower, and Notre Dame Cathedral. Along the Place de la République and next to a Metro station, this hotel is 2 km (1.2 mi) from the Louvre and about 2.5 km (1.5 mi) from the Opera Garnier, Notre Dame Cathedral, and Pompidou Center. A modern seven-storey Paris hotel inspired by the Art Deco style, overlooking Parc de Monceau, one kilometre from the Champs-Élysées. Situated near the airport, this hotel is within 3 mi (5 km) of Aeroville Shopping Center, Usines Centre Outlet Shopping Mall, and Paris Nord Villepinte Exhibition Centre. Gonesse Golf Club and O'Parinor are also within 6 mi (10 km). Why is Paris called the City of Light?